9.5 to 18 VDC, 0.02 ampere nominal. 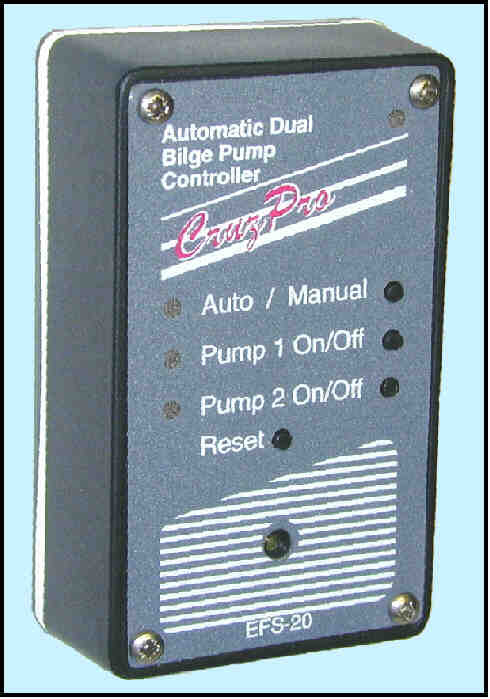 The EFS-10 Automatic Bilge Pump Controller monitors the presence of water in the bilge of your boat and turns on your pump if the electronic float switch detects water continuously for more than 15 seconds. Once turned on, the pump will run for at least 15 seconds. If the water level does not recede within two minutes, an 85 dB alarm sounds until the water recedes or the ALARM RESET switch is pressed. An LED indicator shows you when the bilge pump is running and how many times it was automatically activated since the last SYSTEM RESET. At a glance you can tell if the bilge pump was running while you were away, and how many times it was activated. Whenever the water level drops so as to expose the probe, within 15 seconds the pump will turn off and the pump On/Off LED will flash once every five seconds to tell you it had been activated once since the last system RESET. If the pump is automatically activated again, the pump ON/Off LED will flash twice every five seconds, etc. You can also manually activate the bilge pump from the front panel. The EFS-10 can run a pump drawing a total of up to 8 amps continuously, and pumps up to 15 amps for shorter periods of time. Internal thermal shutdown protects the EFS-10 from overheating when driving large pumps. The rugged electronic float switch is constructed of ABS plastic, stainless steel water probes and is solid potted with epoxy resin. It is totally waterproof, will not jam or false alarm. Pump #1: 7 amps (15 amps until thermal protection cuts in). Pump #2: 13 amps (15 amps until thermal protection cuts in). Thermal protection automatically resets when cooled and pumps starts again, if necessary. LED indicators show which bilge pumps are running and how many times each was activated since the last SYSTEM RESET. At a glance you can tell if the bilge pumps were running while you were away, and how many times each was activated. Whenever the water level drops so as to expose the probe, within 15 seconds the pump will turn off and the Pump 1 On/Off LED will flash once every five seconds to tell you it had been activated once since the last system RESET. 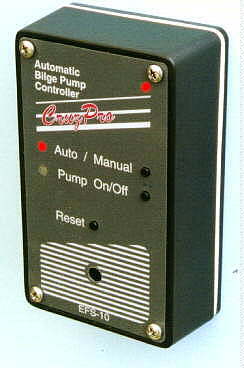 If the pump is automatically activated again, the Pump 1 ON/Off LED will flash twice every five seconds, etc. If, while in automatic mode, the water does not recede below the sensor level within two minutes, pump #2 will be activated and the alarm will sound. If pump #1 has been on three times since the last system RESET and pump #2 has been on once, then the Pump 1 On/Off LED will flash three times and the Pump 2 On/Off LED will flash once every five seconds. The maximum number of flashes for each one of the Pump1 and Pump 2 LEDS is nine flashes every 5 seconds. You can also manually activate the bilge pumps from the front panel. The EFS-20 can run two pumps drawing a total of up to 20 amps continuously, and larger pumps for shorter periods of time. Internal thermal shutdown protects the EFS-20 from overheating when driving large pumps. The EFS-20 is powerful enough to drive some very large pumps but may overheat if required to do so for very long. If the EFS-20 overheats, it will shut down and rapid flash the Pump 1 On/Off and/or Pump 2 On/Off LEDS to indicate the overheated condition. As soon as the thermal protection circuit senses that it is safe to resume, it will switch the appropriate pump(s) back on again (if required).